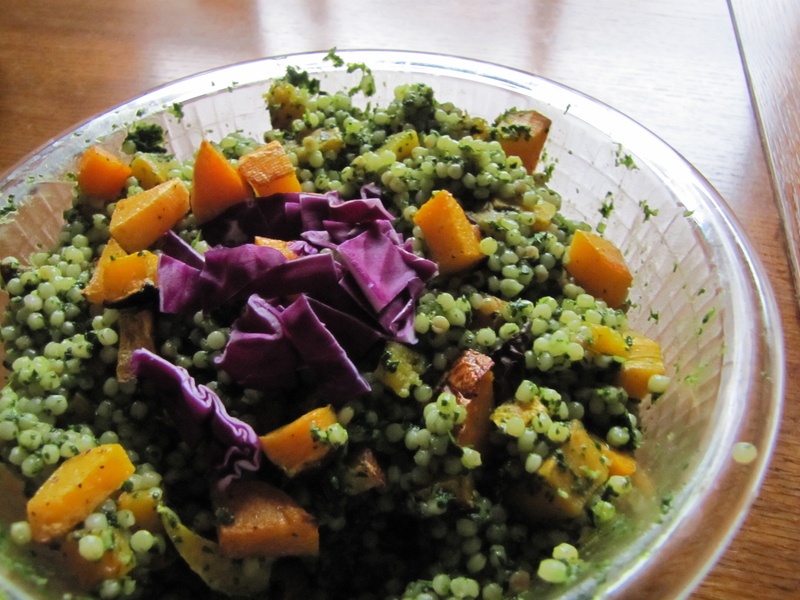 Israeli Cous Cous Salad with Roasted Butternut Squash and Cilantro Sauce – Voila! Since James pointed out that I use the word “awesome” too much in my food blog writing, I’ll try a new adjective: delicioso! This salad lasts the whole week and never gets old when I eat it for lunch day after day. I guess by the end of the week I’m done with it both literally and figuratively; but after a short break I can’t wait to make it and eat it again! 1. Toss the butternut squash cubes with a big drizzle of olive oil and a sprinkling of salt and pepper. Spread them on a rimmed baking pan and roast in the oven until tender and starting to brown, 25-30 minutes. Stir them once or twice during the roasting process. Remove from the oven and set aside. 2. In a small food processor, chop together the garlic, cilantro, cumin, coriander, and 1/2 tsp. salt. Add in the lemon juice and continue to process until finely chopped. Then, with the processor running, drizzle in 3-4 Tbs. of olive oil until it forms a loose sauce. Set aside. 4. In a large serving bowl, toss together the couscous, cilantro sauce, roasted butternut squash pieces. Gently toss until everything is well coated with the sauce. Taste and adjust salt and pepper to taste. Serve warm.